GEORGE GROVES says he is such a nightmare opponent that Carl Froch is suffering sleepless nights in the run-up to their showdown on Saturday. Challenger Groves is a big underdog against three-time world title holder Froch as he bids to dethrone the WBA and IBF super-middleweight king in Manchester. But the Londoner feels he possesses the style and ability to dismantle his vastly experienced Nottingham rival, never mind the surge of confidence he has been given by watching and listening to Froch ahead of this defining showdown. Groves said: “I’ve watched a few of his interviews this week and he doesn’t seem to be saying anything of substance. “But looking at his face, he looks grey. Maybe not everyone will understand what I am saying but it looks like the life is draining out of him. Froch shot a look of disdain when asked if he will shake hands with his bitter rival after their contest, and Groves feels he knows just why. Groves said: “Of course I will touch gloves with him and shake his hand after the fight. He won’t shake hands with me because he’s petrified his so-called legacy, that he has spent a whole career looking for, is going to be blown away in one night. “From the way he is acting, maybe it will. The pressure is building on him now. “Maybe afterwards people will say, ‘He was not as good as he thought he was’. “He is going to have to live in the UK, knowing a British fighter, a young pretender as he likes to call me, has come out and has beaten him. 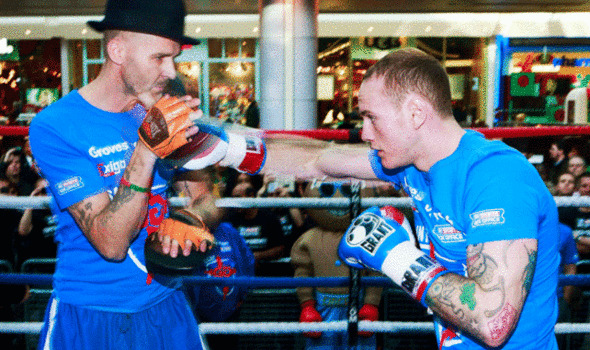 Groves has a new trainer in Paddy Fitzpatrick after his split with long-time mentor Adam Booth two months ago. And Groves feels the link-up gives him even more ammunition with which to hurt the champion . He said: “Paddy has made everything a lot more precise, I’m working on perfection. “Foot placement is important because Carl Froch’s feet are so bad and his defence is so bad. “If you start getting this reputation for having a good chin, you think, ‘I don’t need defence any more’, and the same thing with the jab. “But his jab is a fraction of my jab. If he feels for one second he is going to be able to win the jab exchanges, he is going to be in for a massive shock. And, once he can’t control his jab, where’s he going to go from there? “Carl is not a pressure fighter like he’s built up to be and he likes to punch at arm’s range. “If you look at his weaknesses, it is a struggle to concentrate on his strengths. 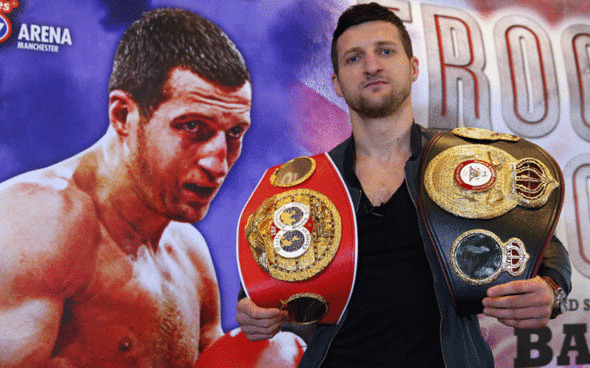 Froch versus Groves is live on Sky Sports Box Office on Saturday. Book via your Sky remote, call 08442 410888 or visit skysports.com/frochgroves.